DECIDING ON MAHAMANA MADAN MOHAN MALAVIYA’S NAME IS AN HONOUR FOR BHARAT RATNA..
December 24 came with a news that indeed mattered, for many of us, Bharat Ratna to Mahamana Pundit Madan Mohan Malaviya. 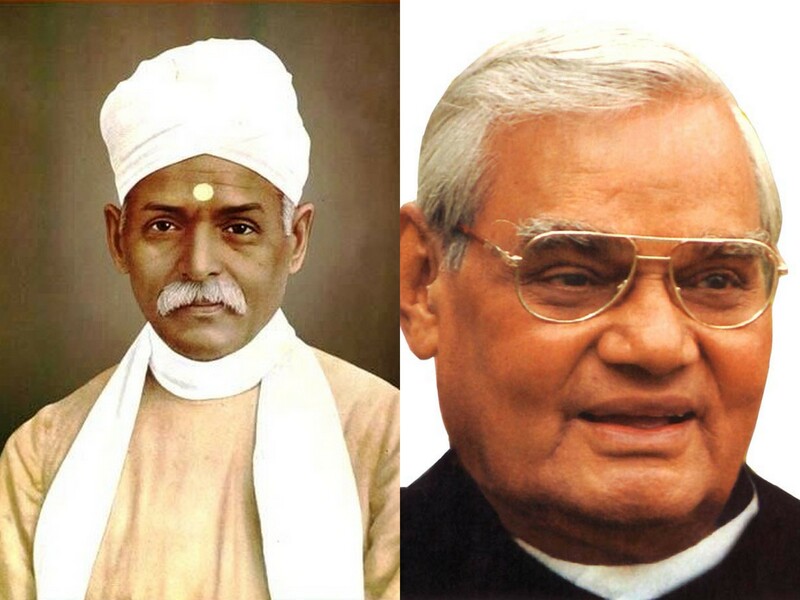 The government announced today Bharat Ratna to Malaviyaji along with former prime minister Atal Bihari Vajpayee. Vajpayee should have been awarded a long ago but it took a BJP government in the Centre to do so, a justified decision, that took so long to arrive at due to silly political considerations. Vajpayee is one of the best prime ministers India has had and Vajpayee, the Statesman, was acceptable across the political ideologies. And making Sachin Tendulkar a Bharat Ratna while ignoring Atal Bihari Vajpayee was never acceptable. Anyway, it is in now, thankfully. The decision to award Bharat Ratna to Malaviyaji, though Narendra Modi had promised, as for Atalji, was bound to raise controversy, given the fact that it came 68 years after his death. Posthumous Bharat Ratna decisions have been controversial but, Mahamana decision, thankfully, is also in. The great Mahamana – yes, the argument does stand that giving Bharat Ratna to Mahamana Madan Mohan Malaviya posthumously would open a Pandora’s Box with supporters popping up even for the likes of Akbar and Ashoka. But, for us, from the Banaras Hindu University fraternity – it was long overdue. And the nation has indeed honoured itself by honouring Mahamana. So, let’s put aside the arguments – even if valid they are – let them be for the gyaanis/experts/analysts populating the others spaces. And let’s feel good about arrival of this decisions. And it should be Mahamana Madan Mohan Malaviya and Atal Behari Vajpayee – the respect that ‘age and period’ command, even if it is Vajpayeeji all around, with Mahamana in passing references only. Anyone who is from Banaras Hindu University and has read to know Mahamana can feel his imprint on the University – on what he wanted to make it – on what it became – on what it is becoming – to think further. The Greats who gave us our Independence, who shaped our social structures and thought processes through the tumultuous colonial years, are much above any recognition including Bharat Ratna. And it’s that way here – the Mahatma, Mohandas Karamchand Gandhi, the Father of the Nation, called himself a devotee of Malaviyaji and deciding on Mahamana’s name is an honour for Bharat Ratna in fact. This entry was posted in BANARAS HINDU UNIVERSITY, CULTURE, INDIAN ICON, PERSONAL REFLECTIONS, THE GREATS WHO WALKED, VARANASI and tagged Atal Bihari Vajpayee, Bharat Ratna, Bharat Ratna 2014, Bharat Ratna for Malaviya, Bharat Ratna for Vajpayee, Madan Mohan Malaviya, Mahamana. Bookmark the permalink.